A man uses his mobile phone under Chinese and Japanese flags in front of the Tiananmen Gate ahead of Japan's Prime Minister Shinzo Abe's visit, in Beijing, Oct. 25, 2018. China is Japan’s largest trading partner and despite meeting Chinese President Xi Jinping on the sidelines of numerous international events, Japanese Prime Minister Shinzo Abe had yet to travel to Beijing for a bilateral summit. All that changed Thursday, when the Japanese leader arrived in the Chinese capital to mark the 40th anniversary of the Treaty of Japan-China Peace and Friendship. It’s Abe’s first trip to Beijing since assuming Japan’s premiership six years ago. During the three-day visit, economic issues are expected to rise to the top of discussions, although regional security issues related to the East China Sea and North Korea will most likely also get some attention. The Japanese leader will sit down with Premier Li Keqiang Thursday and attend a reception to mark the 40th anniversary of the treaty. He then meets Xi on Friday, which will be the first Sino-Japanese summit since 2011. Government officials and analysts expect the three-day summit will lay the groundwork for future meetings and a potential trip to Tokyo by Xi. Japan's Prime Minister Shinzo Abe delivers his policy speech at the lower house of parliament in Tokyo, Oct. 24, 2018. Chinese Foreign Ministry spokeswoman Hua Chunying said the bilateral summit was important and hoped that Beijing and Tokyo could move beyond the past to forge a new future. “[We] will reconfirm that we are partners, not rivals; and reconfirm the consensus that we take each other as opportunities, not challenges; so that we could further improve and develop our ties, and at the same time deepen our mutually beneficial cooperation in all fields,” she said. FILE - North Korean leader Kim Jong Un meets with China's President Xi Jinping, in Dalian, China in this undated photo released, May 9, 2018, by North Korea's Korean Central News Agency (KCNA). When it comes to regional security issues, two of the most prominent topics for Tokyo and Beijing to discuss are competing territorial claims in the East China Sea and security concerns regarding North Korea’s nuclear and ballistic missile programs. Jonathan Berkshire Miller, a senior fellow at the EastWest Institute, expects that Xi and Abe will “agree to disagree” when it comes to the issue surrounding ownership of islands Japan calls Senkaku and referred to as Diaoyu by Beijing. Nevertheless, Newsham notes some positive advancements in bilateral security. He cites a recent naval exchange program agreed to by the two governments as one step forward. But when it comes to North Korea, Newsham expects nothing more than a general statement to work together to denuclearize the Korean Peninsula. According to Miller, China’s role of implementing and maintaining sanctions on Pyongyang has traditionally been a concern for the Japanese leadership. “I think Japan is so focused now on the U.S. and South Korea, and seeing what the Trump administration[’s approach is]” that Tokyo’s has now expanded its attention on North Korea and sanctions beyond Beijing, Miller said. He said there’s concern in Japan about the prospect of sanction relief for North Korea without significant progress on denuclearization and the weakening of deterrence, leading Japan to stress the need to continue to maintain a united line on North Korea. 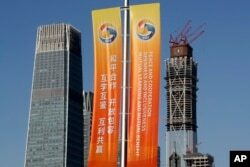 FILE - Banners promoting the Belt and Road Forum for International Cooperation are placed between skyscrapers in the central business district in Beijing, May 11, 2017. One area Miller said is worth watching is what Abe says about China’s Belt and Road initiative, especially since the establishment of a bilateral council. “Japan has showed on a case-by-case basis that it’s willing to endorse working with the Belt and Road, but it hasn’t fully gone on board and said, ‘OK, this is a great initiative, and Japan is fully behind it,’” Miller said. Aside from the Belt and Road initiative discussions, Newsham said the planned implementation of a $25 billion currency swap agreement between the two nations will likely be discussed. Although Newsham doesn’t expect much in terms of concrete agreements resulting from this “feel good” meeting. He expects a probable end result will be a “shaking of the hands and [a] vague sense that they agreed on something,” but without specific details.